Community is important. Unfortunately, the current social trend of attracting like minded individuals and repelling those with opposing views breeds a lack of diversity in thought and culture. While comfortable, these bubbles rob us of opportunities to challenge or defend our beliefs. To mend this dissonance, act with empathy and curiosity, reach across aisles and borders to honor our differences and forge harmony in our communities. 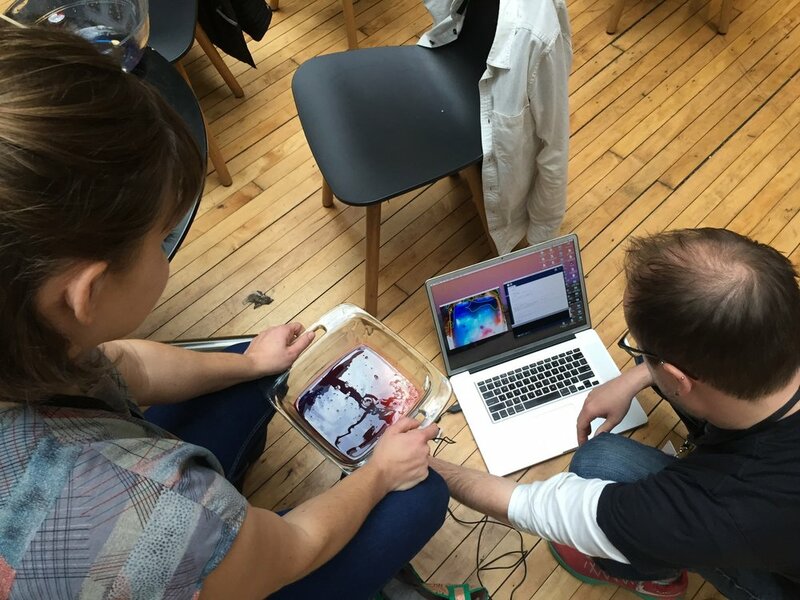 I had the amazing opportunity to participate in an art hack weekend: 48 hours to create art and installations culminating in a 4 hour exhibition. What resulted was M I X, a collaboration with 4 other artists that encouraged people to reflect on their social bubbles through an interactive installation. A custom lit pedestal held a mix of dyed oil and water. Inside the pedestal, along with lights, was a camera watching the fluids interact. I wrote a Processing sketch to characterize the blobs that formed and broke apart. The number of blobs and their overall movement were fed into a Max patch I built to mix pre-composed audio tracks based on the dynamics of the blobs. At rest, the audio composition was dissonant, but as people stirred and mixed the fluids more, the composition became harmonious. The camera feed was also projected on the entry wall to the installation space.